Pay special attention to the routing mode, the default in the hdblcm installer uses ports routing, but as documented in SAP Note 2245631 for a production system hostname routing is recommended. Please make sure the above decisions and data points are completed before performing the configuration. Install the Failover SAP Web Dispatcher guided by SAP Note 908097, my example uses version 7.49 patch 214. Make sure you can login to the SAP Web Dispatcher Administration URL. Depending on your end-users the SAP Web Dispatcher may be located in a separate zone such as the DMZ. Make sure that the SAP Web Dispatcher is running with the updated configuration before installing HANA. In addition, the port (in my example 30133) has to be open between the Failover Web Dispatcher server and the HANA servers in both directions. Next install HANA and XSA, or if HANA is already installed, add XSA. Follow the official HANA installation guides on http://help.sap.com/hana to install the multi-node cluster for host-auto failover. The HANA 2.0 revision has to be at least revision 21. Verify that the URL’s work, a quick example is to test the xsa-admin URL since the XSA_ADMIN user already has the required authorizations whereas it does not for the webide (see webide post-installation link for additional steps). Since we have not configured the SSL certificates yet, you will get a security warning from the browser because a self-signed certificate is used. 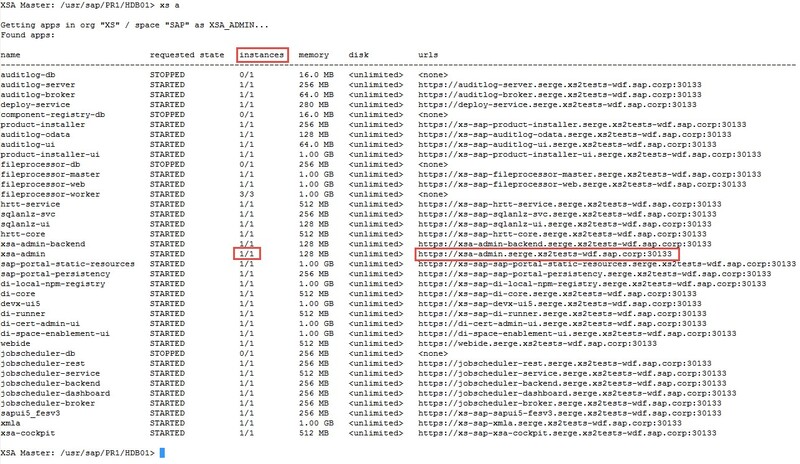 For example, if it shows 0/1 then check why the instance was not started (check xs logs command in the admin guide). Note that it is normal for the apps ending in -db to be stopped, these will be started when needed and no user intervention is required. 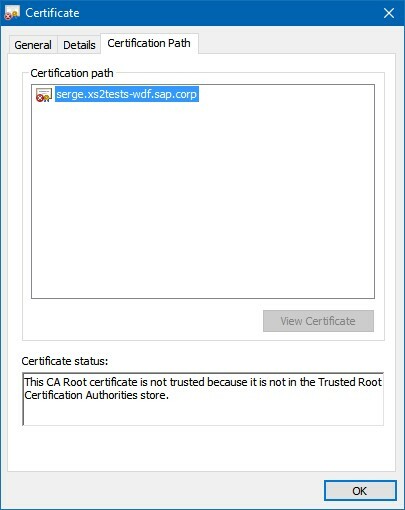 In the SAP Web Dispatcher generate a wildcard certificate request, get it signed by your Certificate Authority of choice, import the certificate chain. Recreate the PSE where the CN is set with a wildcard. 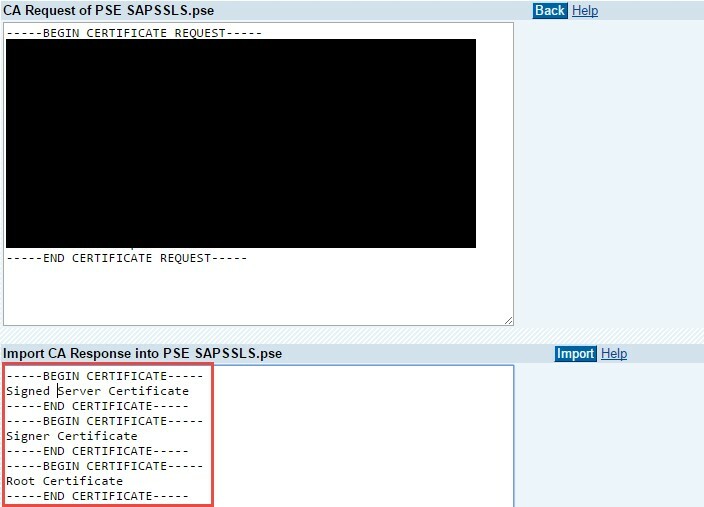 In my example, my XSA domain name was set to serge.xs2tests-wdf.sap.corp, so I set the CN to CN=*. 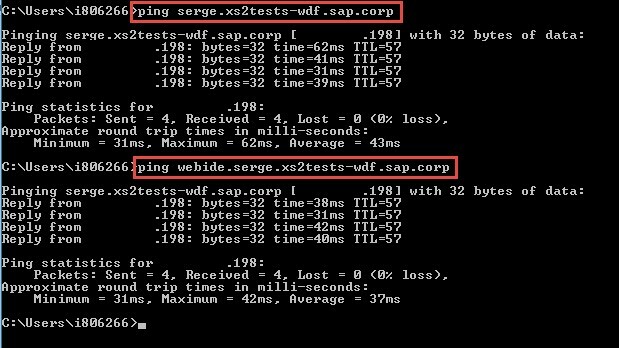 serge.xs2tests-wdf.sap.corp. 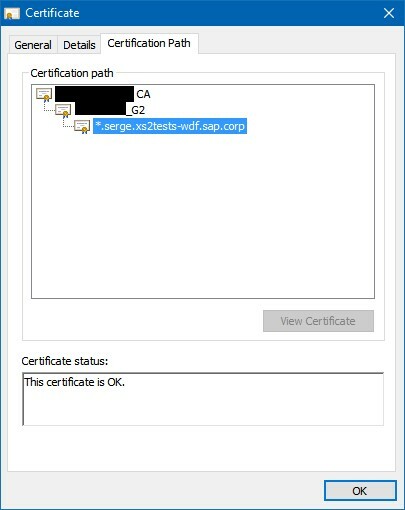 By using the wildcard CN my certificate will apply for webide.serge.xs2tests-wdf.sap.corp, xsa-admin.serge.xs2tests-wdf.sap.corp, etc. The next step is to create the CA request and have it signed by your CA. Make sure to have the full chain available for import including the root CA and intermediate signing certificates. From the command line export the certificate in p12 format, convert it to pem format and prepare the certificate files for XSA import. Login to the Failover Web Dispatcher server as the <sid>adm user (or whichever user is the Linux owner of the Web Dispatcher directories/files). Change to the $SECUDIR directory, in my instance /hana/shared/W01/sec. The next step is to convert the exported .p12 file to .pem format. There are several websites that can do this for you, however using openssl installed locally is a more secure option. Please be aware that using the -nodes option exports the private key unencrypted. Hence cleanup of any files containing the unencrypted private key should be performed after completing the setup. The next step is to take parts of the .pem file and create certificate files importable by XSA. Use your favorite editor to create 2 new files, one will contain the private key and the other the certificate chain. Make sure the lines for “bad attributes”, “subject”, and “issuer” are not part of the new files. In the private key file copy the “PRIVATE KEY” section, including begin and end line from the .pem file. In the chain file copy the certificates, including begin and end line from the .pem file. Once the files are created, copy both files to the Master XSA host as the <sid>adm user of the XSA Master HANA instance. As the target directory, you can select $SECUDIR, which defaults to /usr/sap/<SID>/HDB<##>/<hostname>/sec (example /usr/sap/PR1/HDB01/XSA-Master/sec). As shown in the screenprint next we need to restart the xscontroller. 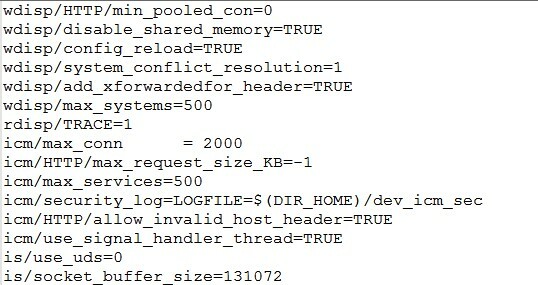 There are several ways in this example we show it from the HANA Studio (be aware that another option is to restart the entire XSA using command “XSA restart”). 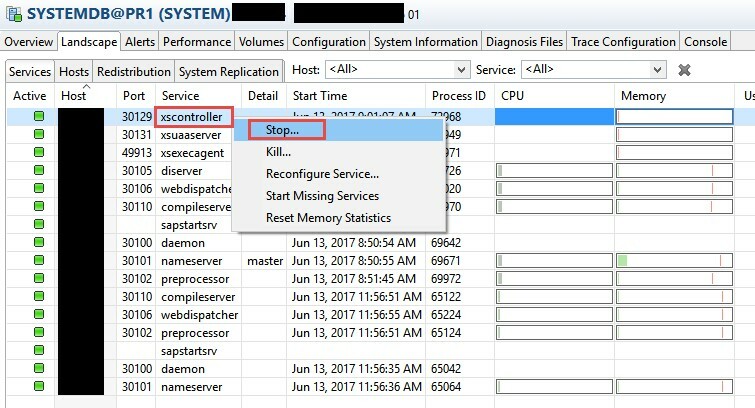 Open the administrator perspective connected to the SYSTEMDB, go to the Landscape tab, right click on xscontroller and choose stop. You will get a pop up message that the xscontroller might restart, since it is the default setting and a newly installed instance the xscontroller will start automatically. You can monitor the xscontroller restart from the landscape tab in the HANA studio, or check the xscontroller_0.log file in the Diagnosis Files tab or at the OS level in the SAP HANA trace directory. Now you are ready to test the failover. Make sure that the HANA 2.0 revision is at least revision 21.